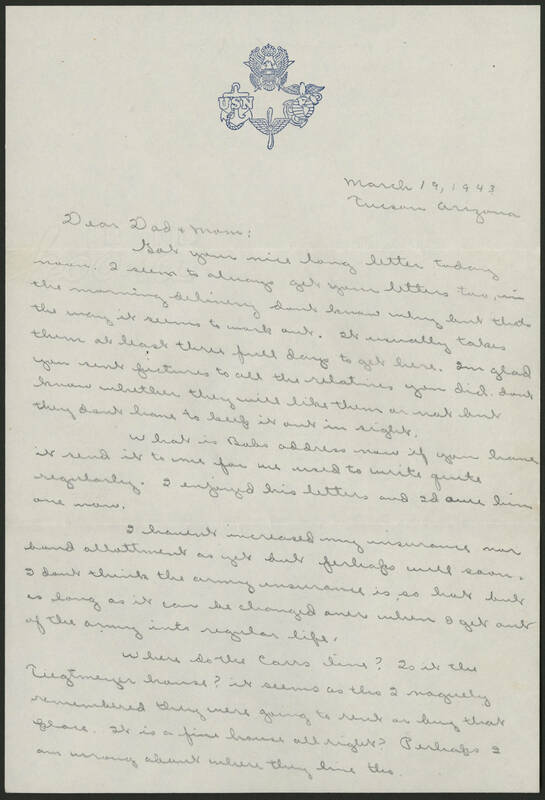 March 19, 1943 Tucson Arizona Dear Dad & Mom: Got your nice long letter today noon. I seem to always get your letters too, in the morning delivery dont know why but thats the way it seems to work out. It usually takes them at least three full days to get here. Im glad you sent pictures to all the relatives you did. dont know whether they will like them or not but they dont have to keep it out in sight. What is Bobs address now if you have it sent it to me for we used to write quite regularly. I enjoyed his letters and Id owe him one now. I havent increased my insurance nor bond allottment as yet but perhaps will soon. I dont think the army insurance is so hot but as long as it can be changed over when I get out of the army into regular life. Where do the Carrs live? Is it the Tiegtmeyer house? it seems as tho I vaguely remembered they were going to rent or buy that place. It is a fine house all right? Perhaps I am wrong about where they live tho.